In this September edition of ‘Things to Do’, we’ve decided to take on the theme of arts and culture to give your mind and spirit some extra nourishment. We all need a dash of curiosity, imagination, and expression to bring more magic to our lives! But before we launch into this theme, we’d like to make a couple of special mentions. First, if you are still craving some outdoor exploration, or were actually waiting for the heat to lift to do it, check out our Summer 2017 Blog for some nature opportunities. Second, if you haven’t gotten your adequate dose of inner stillness, you can still catch Sunset Yoga at the Sporting Club all the way until October 17th. Here’s more info just for you here. And last, but certainly not least, we don’t want you to forget about World Clean Up Day on Sept 15th! To see how you can participate, check out our August blog on the topic right here. Alright, now we’re ready to get started! Here’s our top 7 Arts & Culture picks for September! This is happening TOMORROW, so if you’ve left your weekend plans unattended, this grassroots independent music festival is the thing for YOU! Happening in Batroun, it’s a Lebanese trailblazer not just in bringing together local and international alternative music talent, but in being a ZERO WASTE festival too. A perfect lead-up to World Clean-Up day! In fact, they pay particular attention to showcasing projects “that revolve around sustainability, art and activism…and outdoor activities that are aligned with the philosophy of the Festival.” Sounds pretty fantastic, don’t you think? Buy your tickets and get more information on the line-up and other matters right here. 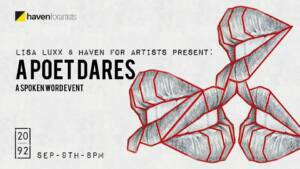 ‘A Poet Dares’, presented by Lisa Luxx and Haven for Artists, offers you a night of performance poetry with an amazing line-up of brave feature poets. And if you’re feeling brave yourself, ‘A Poet Dares’ also has an open mic portion of the evening, so you can get there early and sign up for your own poetry debut. For more info on the where, how and who, check out the event Facebook page. Too short notice for you? No problem! 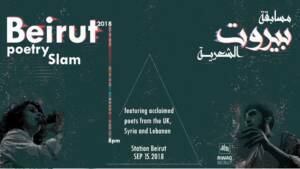 You can always hit up the Beirut Poetry Slam at Station Beirut on September 15th. Again, for more info on the where, how and who, here’s their Facebook event page. Artichoke Studio is a respected social enterprise centre that provides art therapy for community members seeking self-development and mental health support. 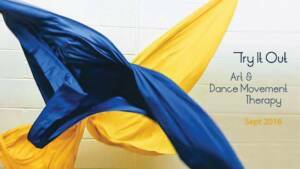 And they are giving you the opportunity to try out Art & Movement Psychotherapy! What is that? It’s a movement-based, non-verbal way of exploring your thoughts, emotions and behaviours. Whether you are searching for a new creative outlet or just curious, you can attend a 1.5 hour session on either Sept. 11th, or Sept. 16th. To find out more and to sign-up before the September 9th registration deadline, check out it here. Perhaps you aren’t so keen on dancing yourself, but enjoy watching others do it. If that’s the case, this gem of dance theatre, written and directed by the prolific Nadine Abu Zak,i is the perfect treat for you. If you were wondering what the cover photo of this blog was about, now you know! 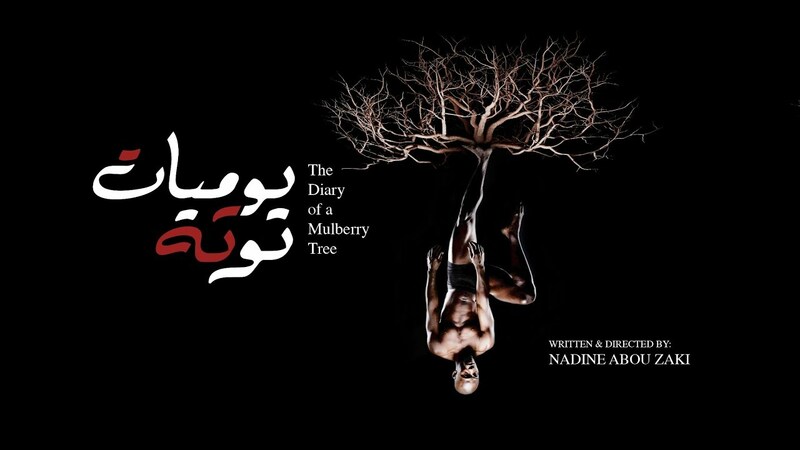 Poignant and important at this moment of environmental crisis, and deeply connected to our history, The Diary of a Mulberry Tree will be performed at Hammana Artist House, Sept. 15th at 7pm! Read more and find the ticket details here. 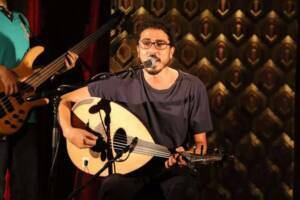 Feel like hearing some fabulous oud, percussion, violin, and nay while listening to Ashraf El Chouli sing original songs, as well as a set of undiscovered Palestinian songs too? Well luckily, you can do just that on September 21st at Metro Al Madinat! For more info on the event and to purchase tickets, follow this link. For more info on Ashraf El Chouli! Don’t miss out! You can get more info right here. Yes that’s a picture of an embroidered uterus up above. And no, that embroidered uterus is not a production of Alwan Salma. I just liked it. 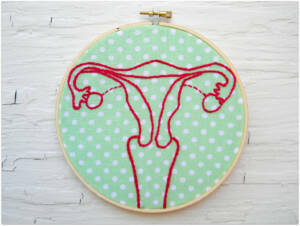 Maybe you’d like to embroider a uterus too. But I’m getting ahead of myself. Let’s start again: Whether you’d like to delve into patchwork and quilting, or try your hand at intricate embroidery to make some art for your home and extra special gifts for others, Alwan Salma is the place for you. Teaching increasingly forgotten arts and practices, these workshops allow you to participate in rich traditions while also enjoying community and the meditative process of using needle and thread to create. I’d imagine you can get quirky with your artistic expression too, but don’t take my word for it. If patchwork and quilting caught your eye, it’s on every Tuesday until September 30th. You can sign up and find more info here. If you think embroidery is more your thing, you can brighten up your Saturday mornings until September 30th too. Here’s what you need to know. And that’s all folks! Have a great September, and don’t forget, if you delve into any of these listed offerings, do let us know in the comments. We love hearing from you!